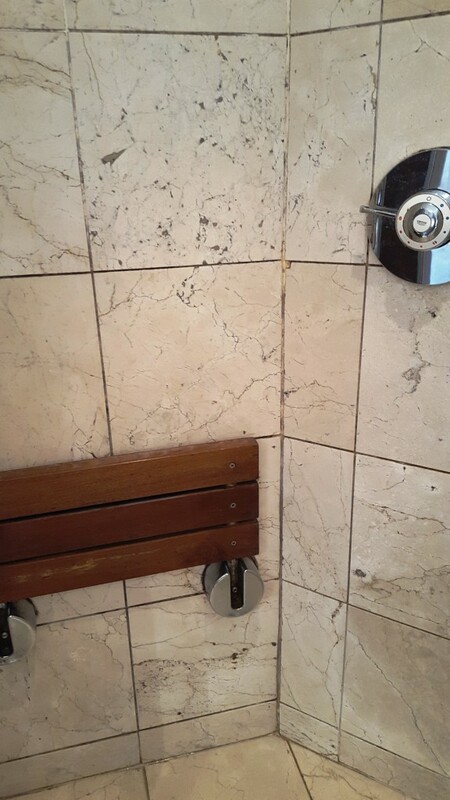 Tiled shower cubicles can very easily become tired and grubby looking without the right care. The shampoos and soaps we use in our everyday lives can have long lasting damage if their effects are not sufficiently dealt with, with grout mould being a very common problem for property owners in the UK where we have a cold climate that encourages us to seal up our homes limiting natural ventilation. 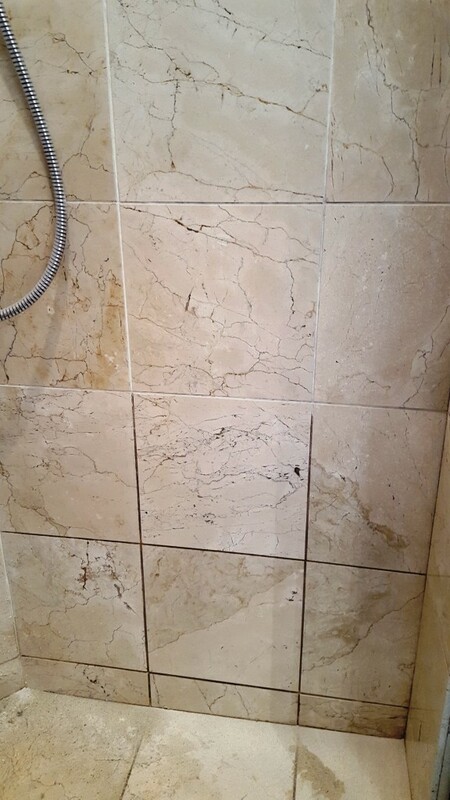 At this property in the small village of Beddau, near Cardiff, my customer had a particularly poorly maintained Marble tiled shower cubicle suffering from bad staining. 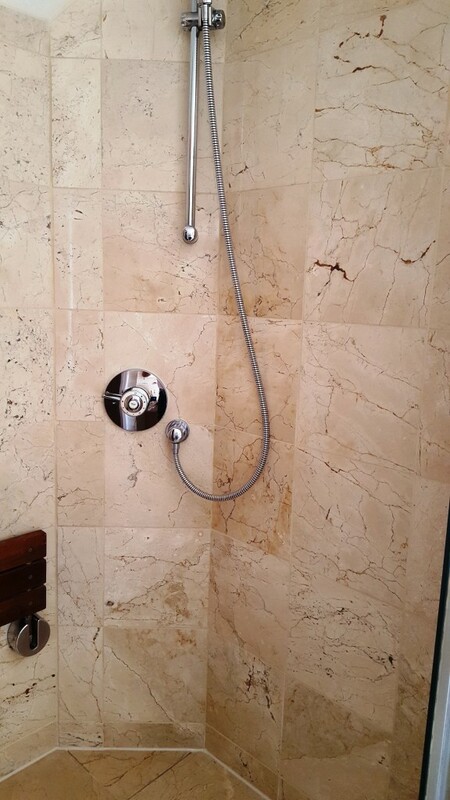 Since Marble is an acid-sensitive stone it is especially vulnerable to damage when exposed to even slightly acidic shower products. The grout was also in a bad way, having turned from a pleasant off white colour to black. The entire area was now well overdue from some attention from the Tile Doctor. To begin the restoration of these tiles I had to remove any old sealer. I did this by applying a combination of Tile Doctor Pro Clean, which is a versatile cleaner, stripper and degreaser, and Tile Doctor NanoTech HBU, which is a more powerful product designed for the removal of heavy soil buildup. 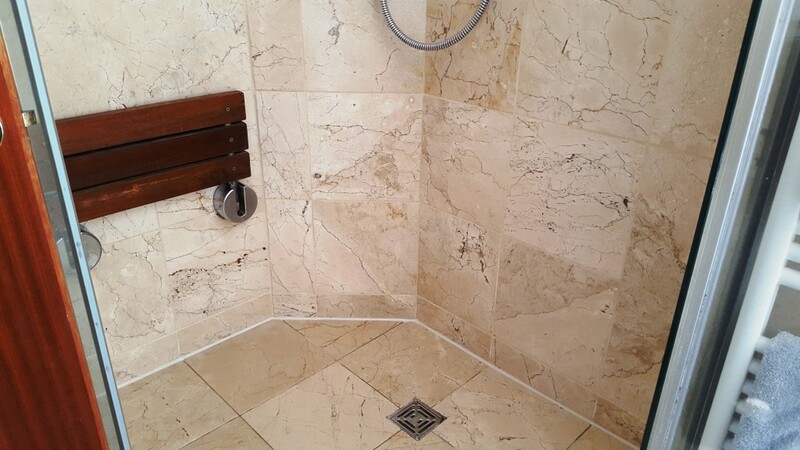 As the old sealer came away, I left the two products to soak into the tiles to lift out the stains and ingrained dirt caused by the Marble’s exposure to shampoo and soaps. This really helped to alleviate the grubby appearance previously held by the tiles. As previously mentioned, the grout lines were also in a really bad state. Undeterred, I attempted for three hours to clean the grout lines with unsatisfactory results, and so resolved instead to remove the old grout entirely and re-grout with a new Jasmine coloured grout throughout the bathroom. 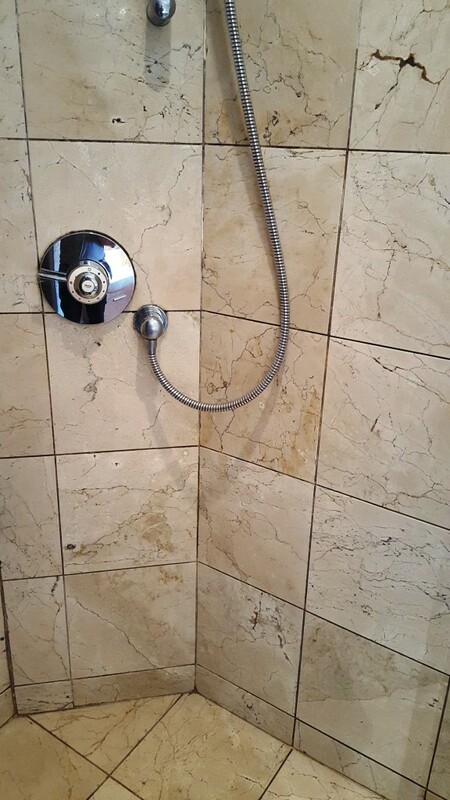 I did consider simply recolouring the grout with one of our Grout Colourants but, as an experienced tiler, I felt for me it would quicker and easier to achieve the required results by re-grouting. After leaving the grout and tiles to dry overnight following the cleaning and regrouping, I returned to the property to seal the area. To do this I opted to use two coats of Tile Doctor Colour Grow, our solvent-based impregnating sealer which fills the pores of the stone to act as a barrier against trapped dirt and stains, and to prevent further contamination. As a colour intensifying sealer it really emphasised the natural shades in the Marble. Colour Grow can achieve similar results on other types of unpolished stone, including Limestone, Flagstones, Quarry, Sandstone and Slate. I added the finishing touches to the restoration by removing all the mouldy silicone and replaced it with new silicone. Though this wasn’t the easiest of jobs, the final result is one of which I am particularly proud. It certainly pleased the customer!